Friday’s Grimm touches on a sad topic with a wesen twist. And the main story progresses as Eve tries to learn more about the mirrors and Renard continues his progress towards working with the good guys again. Spoilers after the break. The episode starts with Monroe and Rosalee covering up all the mirrors in their house, since Eve will be staying with them. Monroe starts to wonder if it’s not just mirrors, but any reflective surface they need to worry about, but Rosalee tells him to just worry about mirrors for now. 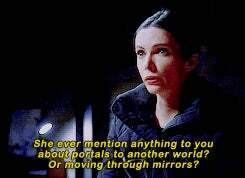 Speaking of Eve, she visits Adalind, to ask if she knows anything about mirror, or magic used to open portals to other worlds. She’s tired of waiting for the freaky skull to go after her, she wants to go after it. 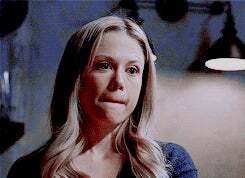 And she’s hoping Adalind might have learned something from her mother. 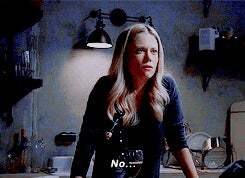 Adalind feels they should act as a group, but Eve is certain that being able to see the symbols makes her connected to the skull and whatever is going to happen. 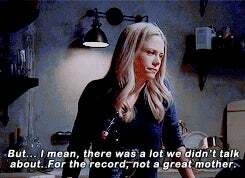 There are 3 books that Eve gets from Adalind, and she spends the rest of the episode going through them to see if there’s anything about mirrors or opening portals. When Nick gets home, Adalind mentions lending the books to Eve and that she’s concerned Eve is going to act alone and do something rash. Nick says he’ll talk to her, but first he gets a call and has a case. A woman had been attacked in a parking lot and her guts were torn out. Wu, Hank and Nick are all thinking “wesen” but aren’t sure of the motive for the attack. Nothing was stolen, either material goods or anything that could be ritualistic. We then are shown a retirement home, where an orderly, Mason Wilcox, is helping a senior woman to her room, as she talks about running through the forest and tasting blood. He shrugs it off as “crazy old lady talk” but when he turns around to get her an extra blanket, she woges and attacks him. In the course of defending himself, the orderly ends up with his hands around her throat, just in time for her to unwoge and another orderly to witness him seemingly attack one of the senior residents. Later that night, a bug looking wesen appears and does something to the senile wesen. Nick and Hank are called over to the senior home the next morning because even though it appears she died naturally, the orderly who saw what looked like an assault is claiming she died from injuries sustained by Mason Wilcox, who has since been arrested. There are marks on her throat, but Dr. Landeaux, who treats the seniors insists she died of natural causes. Nick and Hank question Mason, who insists the old woman “turned into some kind of monster” and lucky for him, he’s talking to 2 of the only 3 people that would believe him and also want to help him. Nick and Hank visit Monroe and Rosalee to ask if they’ve encountered anything like this, and they reluctantly tell Nick about the Gavatter Tod, aka “Godfather Death”, a wesen that provides a peaceful death to aging wesen who have gone senile and suffer from uncontrolled woges, and is a part of life in the wesen community. Nick wants to talk to him to learn more. Rosalee calls, under the pretense that Monroe is senile and needs “taking care of”. When the Gevatter Tod shows up, it’s a familiar face, Dr. Landeaux. Nick reveals he’s a Grimm, and after a bit of a freakout, everyone calms down and Nick explains he just wants to know if Dr. Landeaux was the one who helped the senior at the retirement home meet her end, and that Mason Wilcox could go to jail as a murder suspect. The doctor admits to it and expresses his regret that he waited too long. Nick asks if he can testify that she died of natural causes so that Mason can be freed instead of being punished for defending himself from a wesen attack. Just then, the doctor gets a call from another wesen, and Rosalee realizes it’s one of her long time customers, who had recently purchases large doses of melatonin. It turns out she was trying to keep her husband asleep at night, but it wasn’t working, and it turns out her husband was the one who attacked the woman in the parking lot,and another victim a few nights before that. Nick and Hank help to bring him back home, and are able to confirm he’s the one killing people, but realize with his senility, they can’t take him to trial, so Nick tells the doctor to do what he must and he won’t interfere. And then I cried a little. On the Renard front, Sean calls Adalind to ask about Diana’s drawings and insists on seeing the tunnel. She tells him that’s something he’ll have to take up with Nick, so he does. But when Renard refuses to tell Nick what he’s learned and from who, Nick tells him they can talk when they’re both willing to share what they know. Eve makes a breakthrough when she reads about Blood Magic, and against everyone’s advise, decides to try it on her own. That’s right, she’s broken on through to the other side. Looks like we’ll be seeing more of that other dimension next episode. Glad to see Renard is on his way to working with the group again, makes sense with Diana’s involvement, and it’ll be good to see them all working together one last time. Seriously, that whole senile wesen thing really was sad, and something I’d never really thought about. So I’m glad they took the time to show this, even with so few episodes left. Eve better hope her powers work in that other place.